Four years after their inception in 2003, Colorado-based New Direction IRA was proud to begin offering self-directed retirement services to the people of Hawaii. For 10 years under the direction of Dan Falardeau, the Hawaii office has provided the most comprehensive customer relations and educational services available to alternative asset investors in the islands. As President of New Direction IRA’s Hawaii Division, Mr. Falardeau has emphasized the development and maintenance of strong personal and professional relationships. He has worked diligently to earn the confidence of Hawaii locals. Mr. Falardeau began networking within the Hawaii market in 1992, which has provided him with a broad understanding of the unique investment needs and selective culture of the region. The co-founders and principal owners of New Direction IRA, Bill Humphrey and Catherine Wynne, understood that a local presence was necessary to build trust in the Hawaii market. Many Mainland companies—especially self-directed retirement providers—fail to offer direct access to services in the islands, which tasks Hawaii residents with contacting offices on the Mainland. This can hinder business practices, as time zone differences may prove problematic and the specific needs of Hawaiian investors may not be met. Mr. Falardeau alleviates these concerns by providing direct education and by building relationships through face-to-face interaction. In addition to earning client confidence, Mr. Falardeau offers specialized expertise in the alternative asset types that characterize Hawaii. 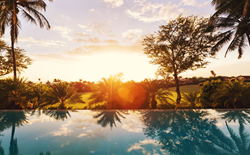 Real estate continues to rise in popularity as a self-directed retirement investment, and IRA property ownership in Hawaii, while potentially lucrative, comes with special considerations as well. Koa trees can only be found in Hawaii and, as natural resources with a variety of purposes, represent a genuine investment opportunity for an IRA, 401(k), or HSA holder. As of August 2017, Mr. Falardeau and New Direction IRA provide administrative services for over 600 active clients in the state of Hawaii.